VL92 Gin was born of the quest of two entrepreneurs to find their ultimate gin. 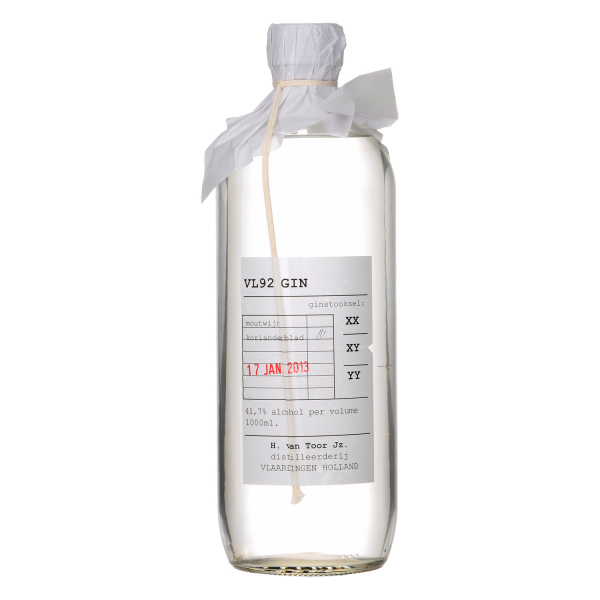 Built upon a malt wine foundation, VL92 Gin has its roots in the Dutch genever tradition. The malt wine gives it its boldness; its complexity derives from the play between botanical elements that finish with the eccentric, citrusy endnote of a most surprising ingredient: coriander leaf. In our regular gin (XY) we use around 25% malt wine as base for the alcohol. Flavour-wise we approach it as if it were a botanical when combined with the rest of the botanicals during final distillation. It’s partly playing with the 'missing link' between gin and genever but from our perspective definitely a gin for it’s flowery/citrusy complexity. On May 15th, 2012, the first shipment of VL92 Gin to be distributed outside of the Netherlands was delivered in London. The gin arrived in London on a historic Dutch ship, having set sail from its home base in Vlaardingen. Co-founder Sietze Kalkwijk presented the first box of VL92 Gin to the Artesian Bar team, led by world-famous bartender Alex Kratena. Due to popular demand in England, the creators of the Dutch VL92 Gin have arranged to have the gin cross the Channel - and to cross it in style. VL92 Gin is named after a historic sailing freighter from the Dutch town of Vlaardingen. On May 11, the original VL92 freighter will set sail for England along with two other historic Vlaardingen loggers, with the VL92 Gin on board. The VL92, nicknamed "The Balder", will take the lead, followed by "The Iris" and "The Galant". The Shipment: The ship moored next to the Tower Bridge in London the evening of May 14. On Tuesday, May 15, with gin enthusiasts and special guests in the audience, the first bottles of VL92 Gin were officially handed to the early adaptors aboard. Related links to "VL92 Gin"
Customer evaluation for "VL92 Gin"